Perfect for fans of G. M. Malliet and M. C. Beaton, The Shadow of Death is divine entertainment from a talented debut writer. 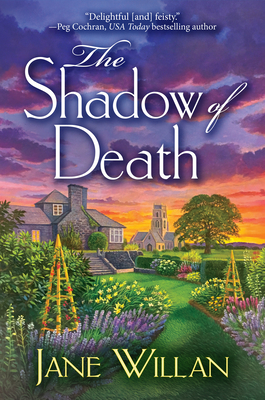 A charming and clever traditional mystery debut set at a bucolic Welsh convent, The Shadow of Death introduces Sister Agatha, a mystery-loving nun who finds herself in the midst of a real-life murder case. The sisters of Gwenafwy Abbey have cherished their contemplative life--days spent in prayer, reflection, tending the Convent's vegetable gardens and making their award-winning organic cheese, Heavenly Gouda. Life seems perfect, except for Sister Agatha, a die-hard mystery fan who despairs of ever finding any real life inspiration for her own novel. That is, until the Abbey's sexton is found dead under an avalanche of gouda. Despite the reservations of the local constable, Sister Agatha is convinced it's murder and the game is afoot. Armed only with the notes she's scribbled during her favorite podcast, How to Write a Mystery Novel, as well as a lessons learned from crime heroes ranging from Hercule Poirot to Stephanie Plum, Sister Agatha leads the nuns of Gwenafwy Abbey (and her unwitting sidekick, Father Selwyn) as they begin a race against time to resolve the death of Jacob, save the Abbey, exonerate a beloved postulant, and restore the good name of their cheese. Jane Willan wants to live in a world where everyone has time to read their favorite books, drink good coffee and walk their dog on the beach, but until that can happen she enjoys life as a pastor and writer. When she's not working on a sermon, or hiking with her husband, Don, you can find her re-reading Jane Eyre, binge-watching Downton Abbey and trying out new ways to avoid exercise. This is her first Sister Agatha and Father Selwyn mystery.